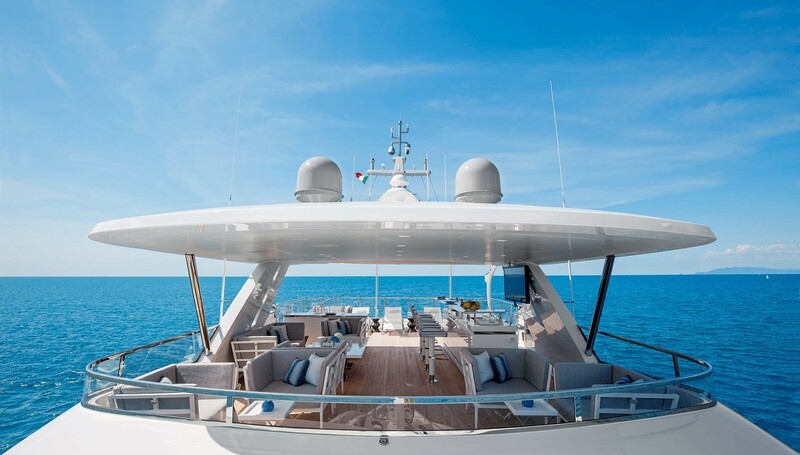 The magnificent 43m Veloce 140’ superyacht was launched by Benetti SpA in 2015 in Italy. 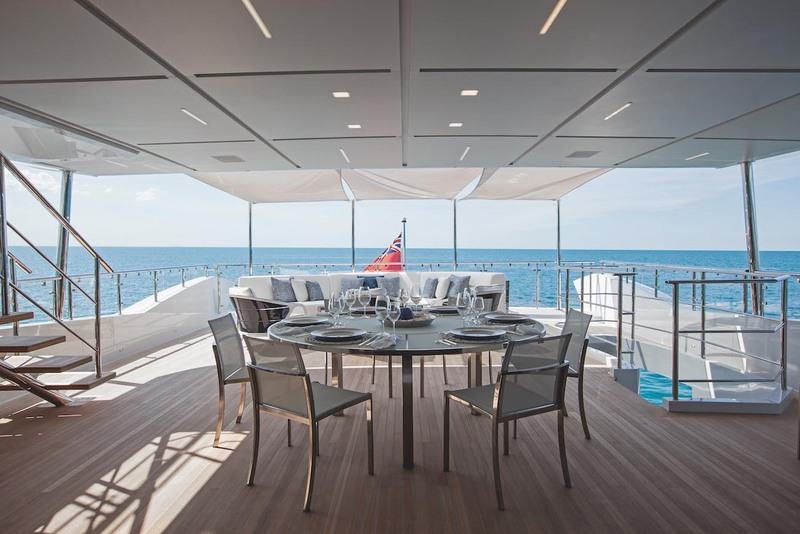 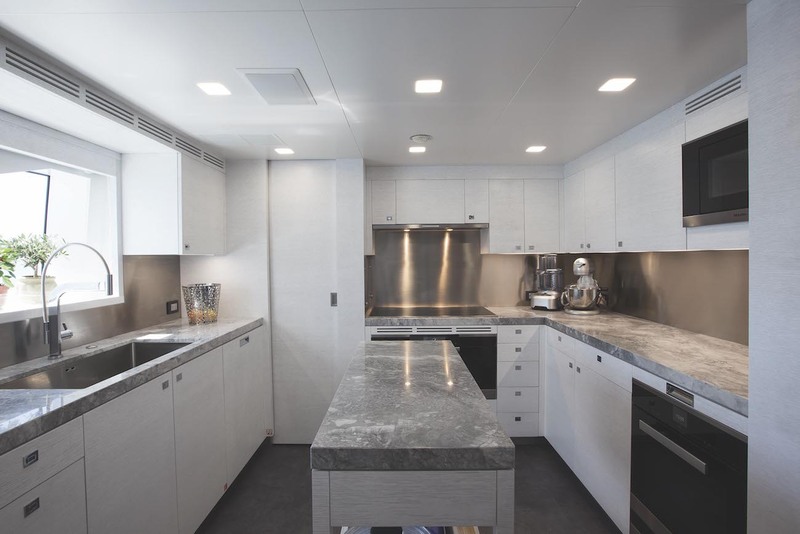 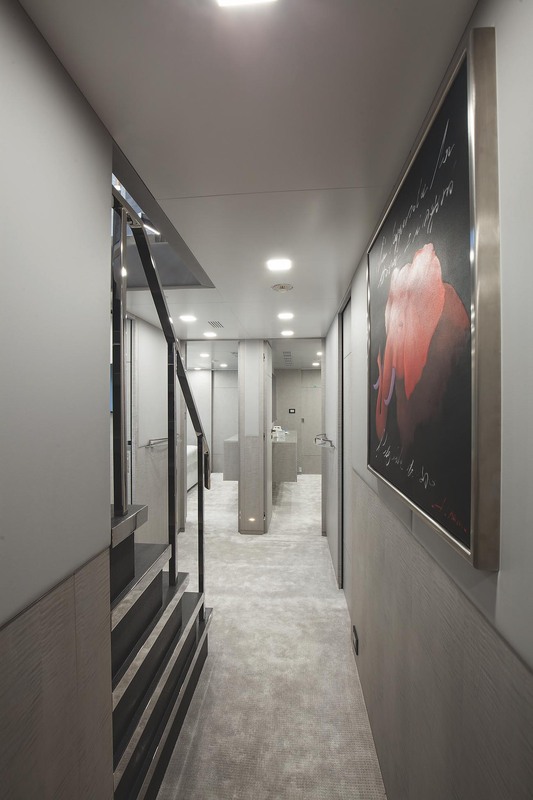 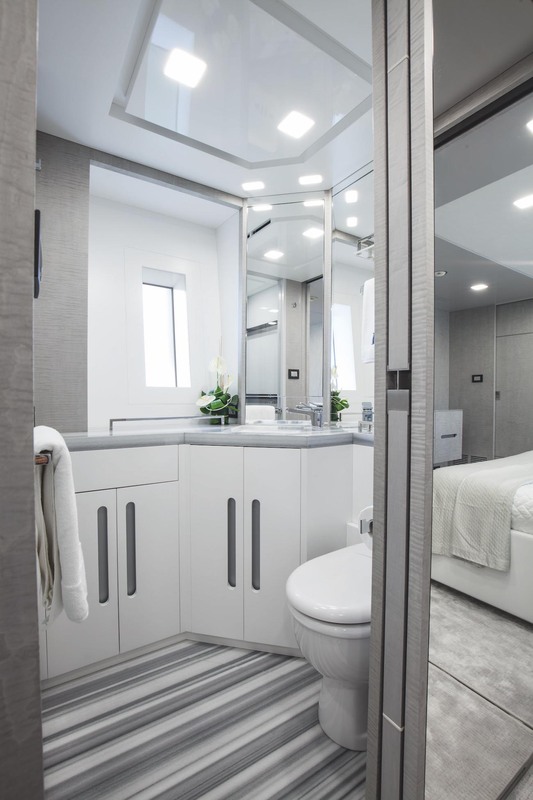 The beautifully airy and light interior of the yacht was created by Redman Whiteley Dixon while the exterior was designed by Stefano Righini. 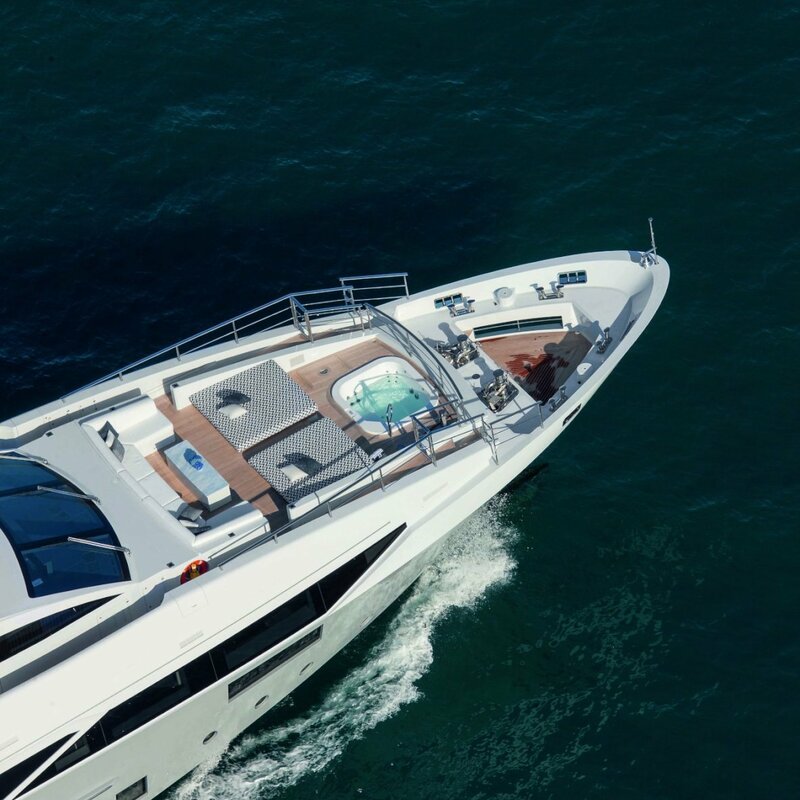 This ultra-luxurious yacht sleeps up to 10 charter guests in five luxury cabins and carries a crew of up to 8 who ensure a relaxed yachting experience for everyone. 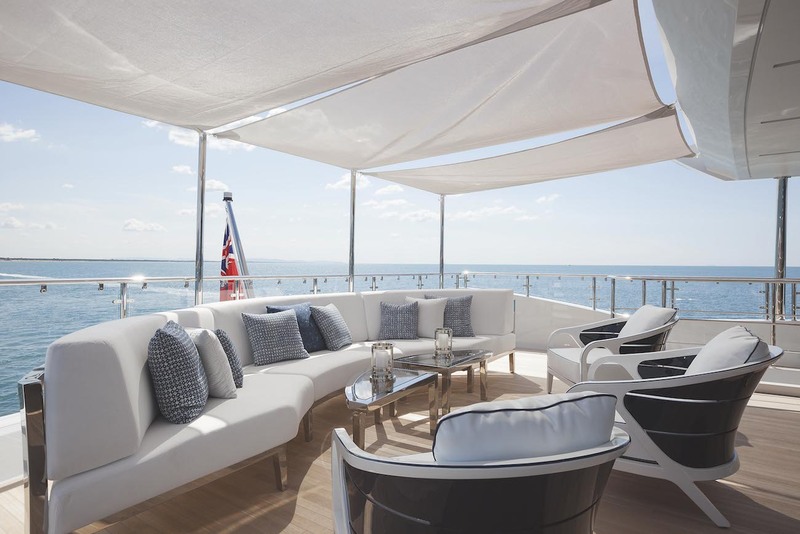 Furnishings on board are timeless, beautiful and elegant with sumptuous seating throughout. 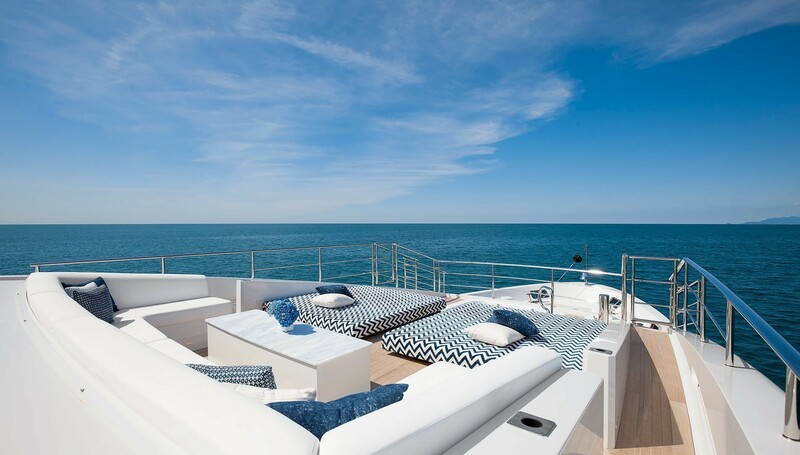 The atmosphere is relaxing, comfortable and timeless. 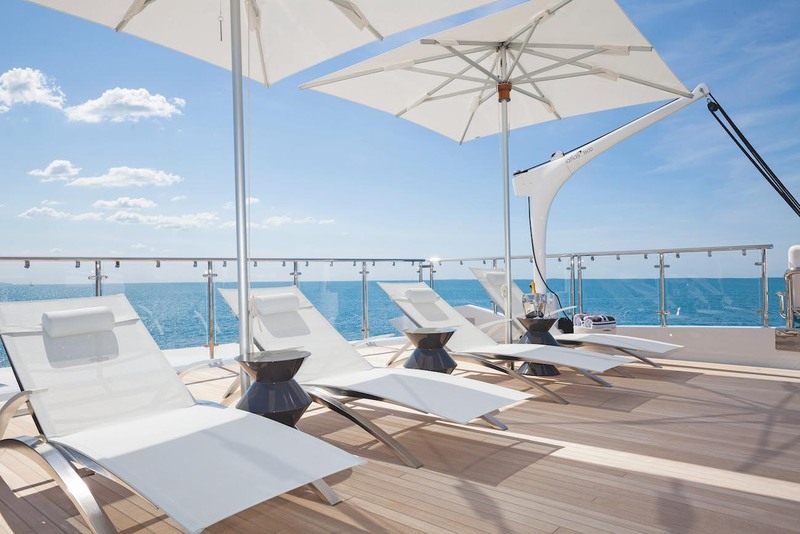 Fantastic leisure and entertainment facilities are provided which make her a perfect for discerning holidaymakers. 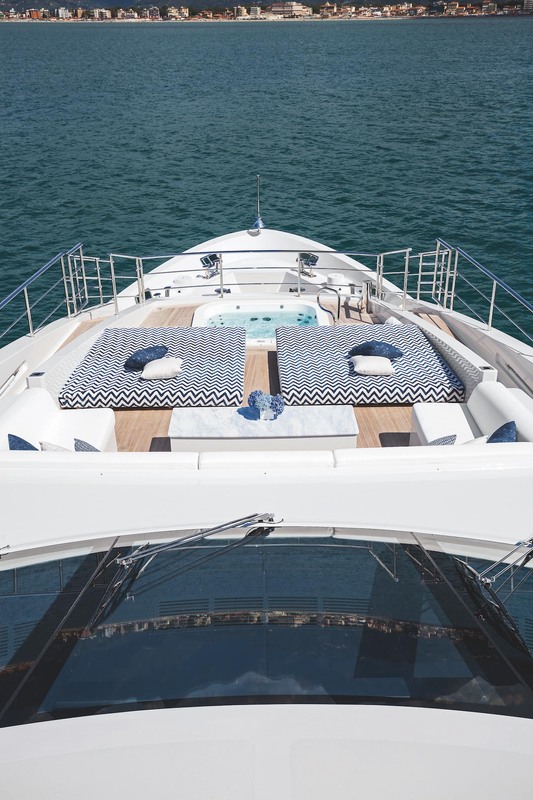 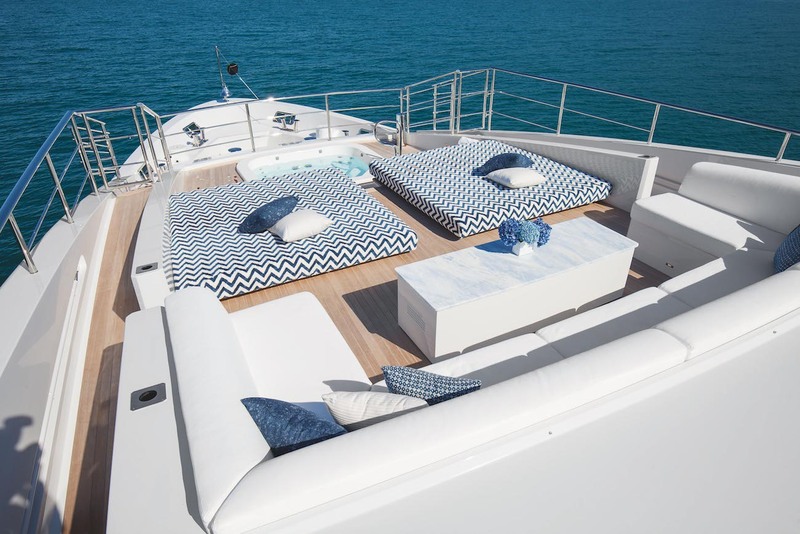 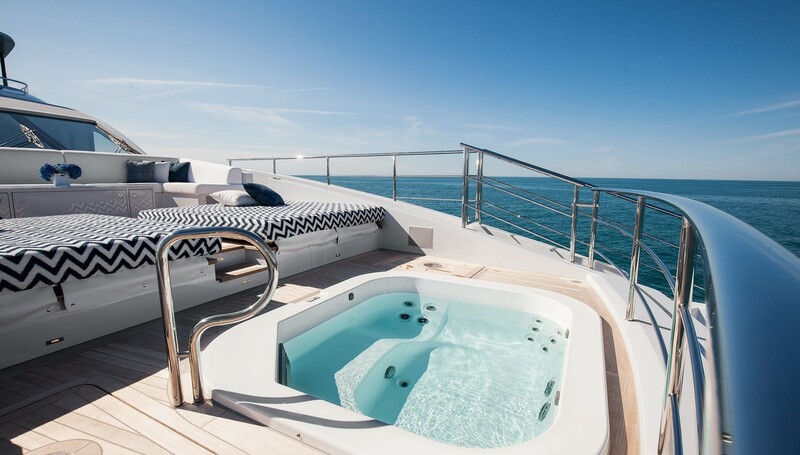 Veloce 140’s exquisite interior offers a stylish foredeck Jacuzzi area, a fully equipped gym, a huge sun deck (77 sqm) as well as accommodation for 10. 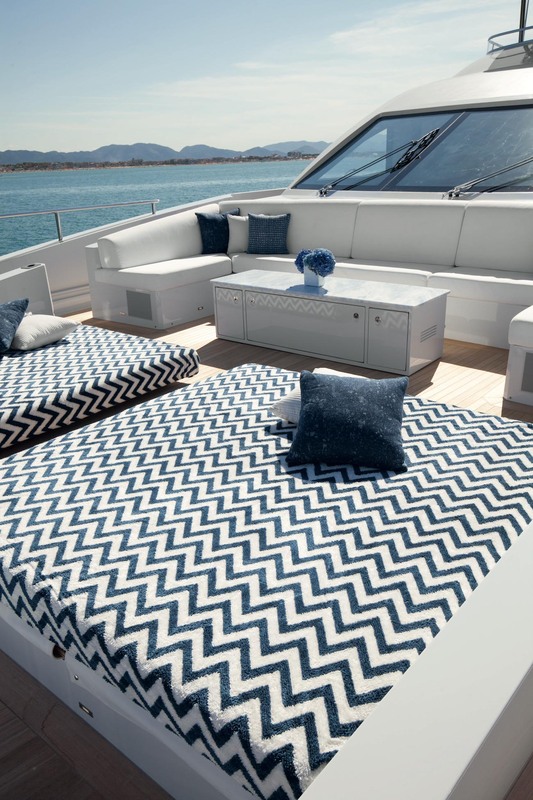 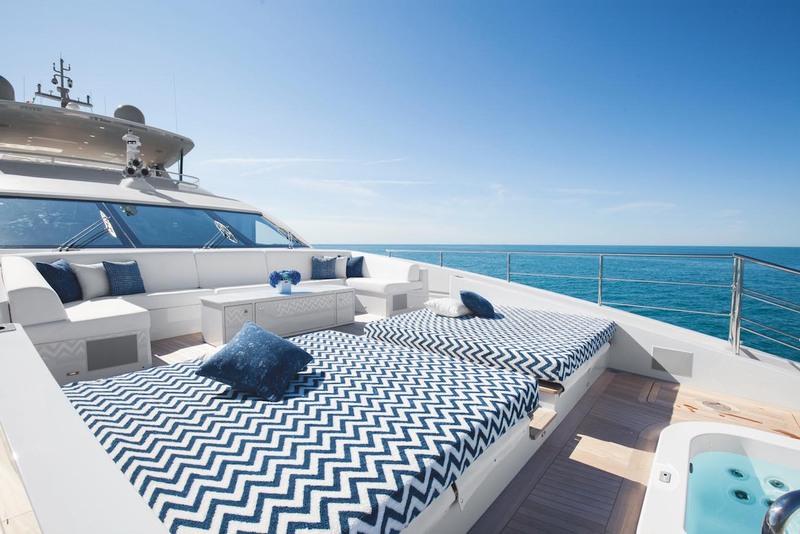 The main deck has a relaxation room with daybed and a large television. 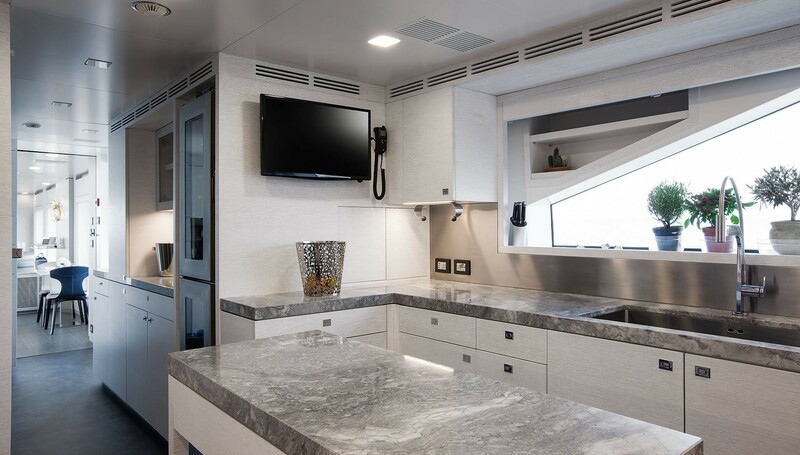 This area flows into the master cabin. 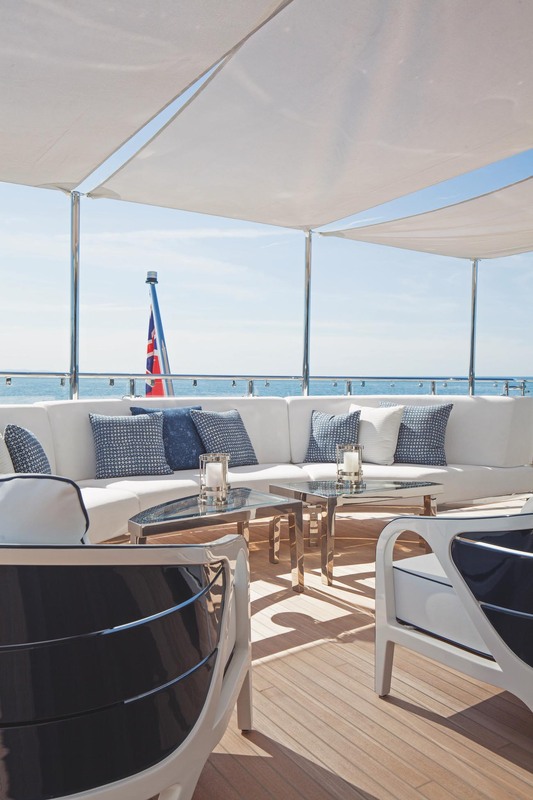 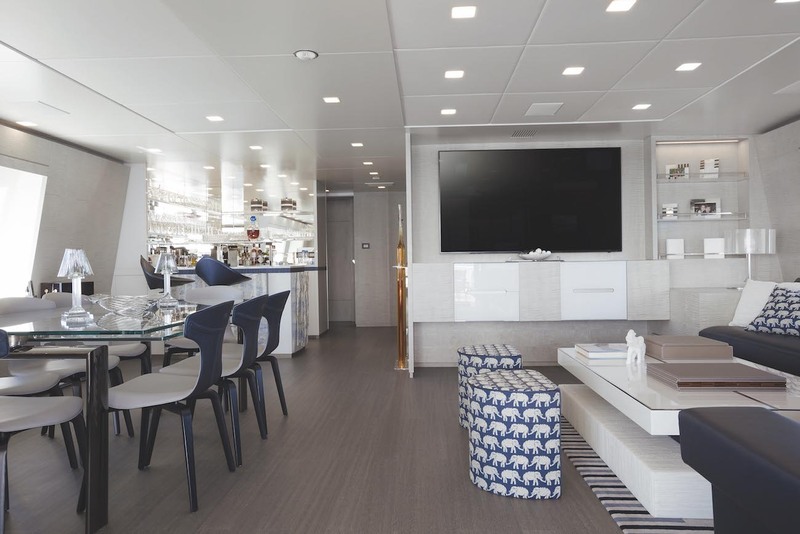 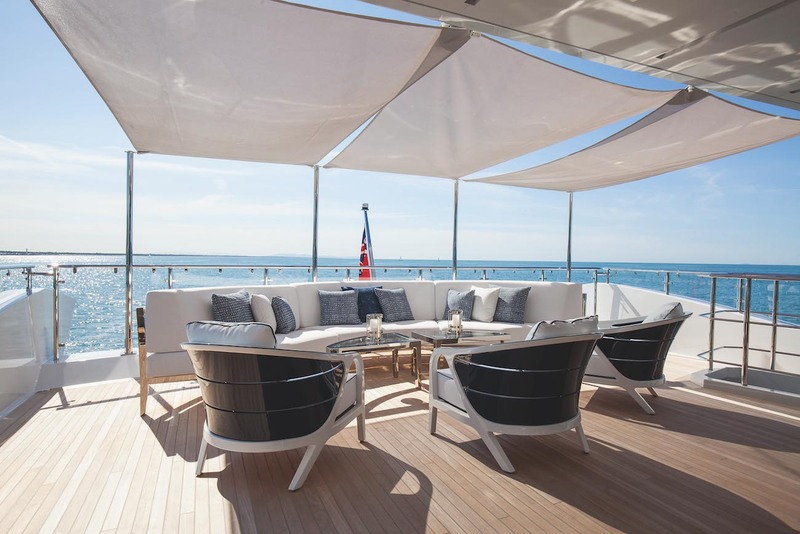 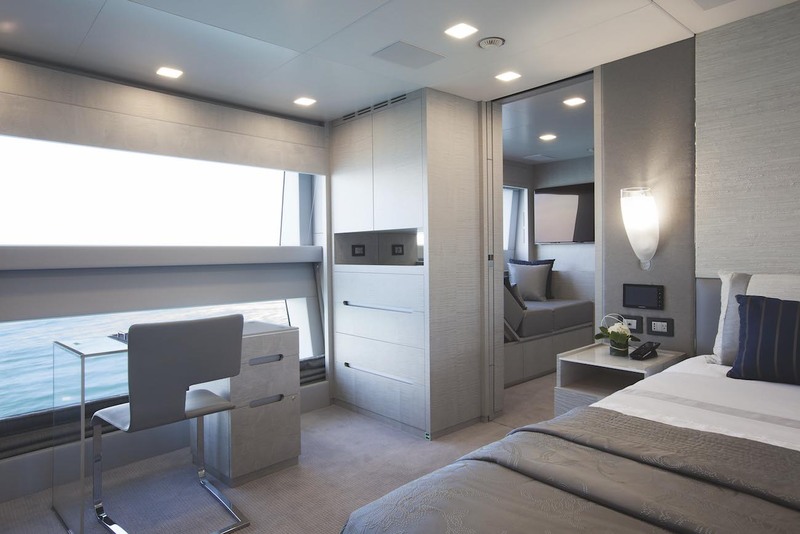 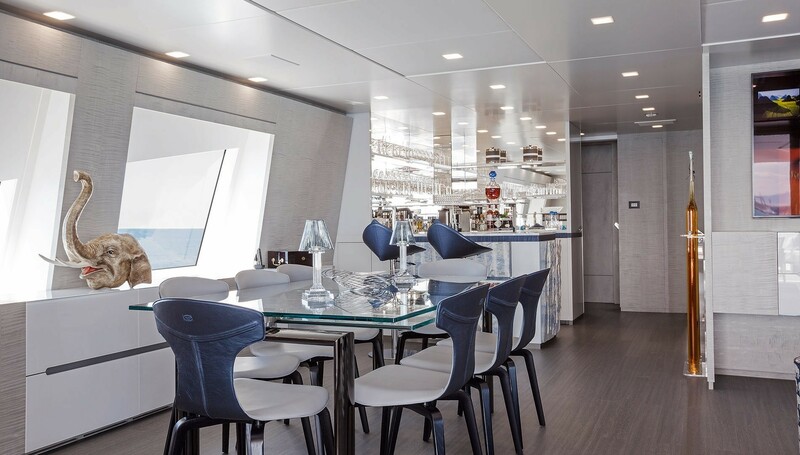 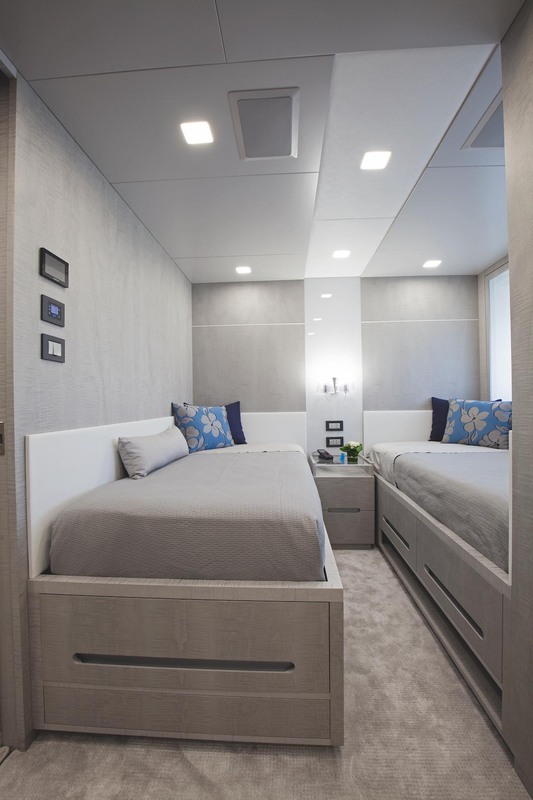 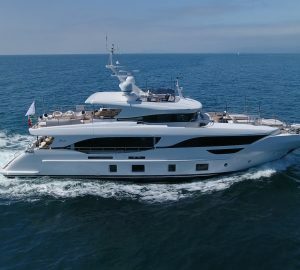 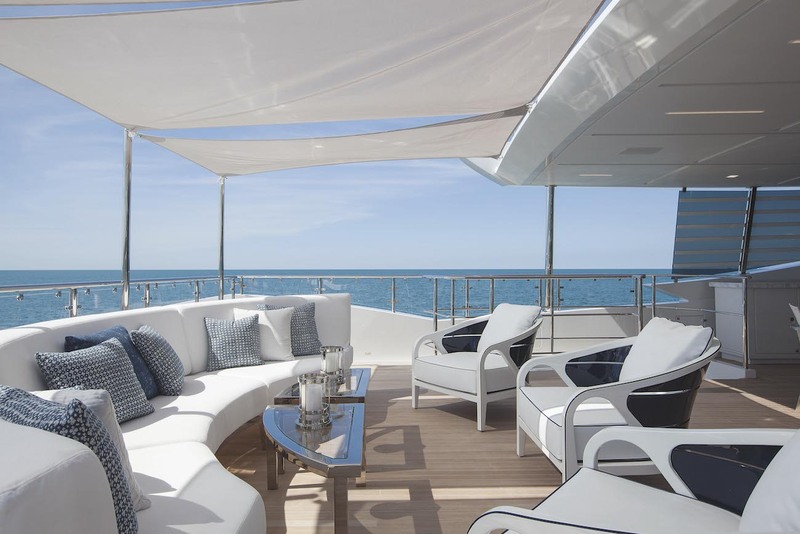 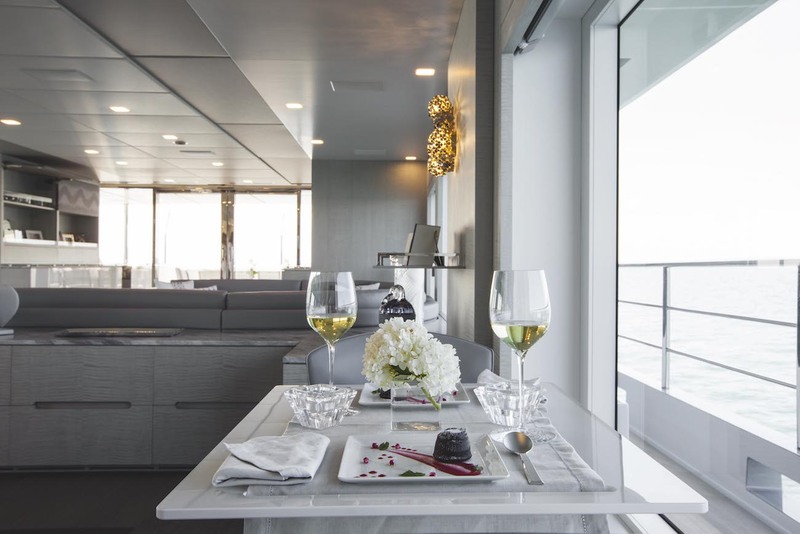 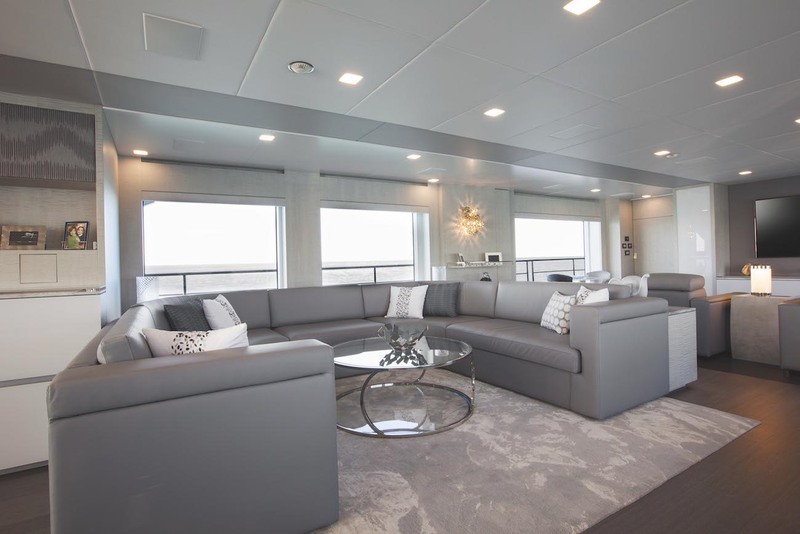 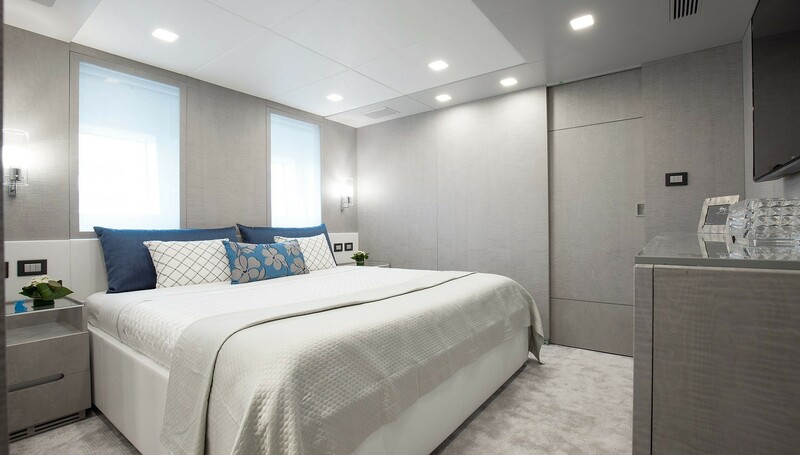 With its elegant sycamore walls and hand-picked, the interior offers a truly unique ambience on board.There is also a sun pad area, a sundeck bar with comfortable seating and al fresco dining. 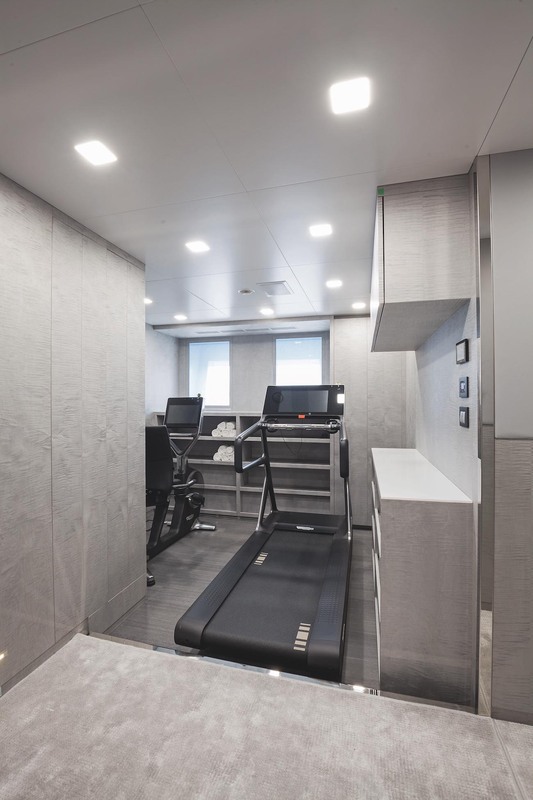 The gym is forward on the lower deck and has an impressive ceiling height. 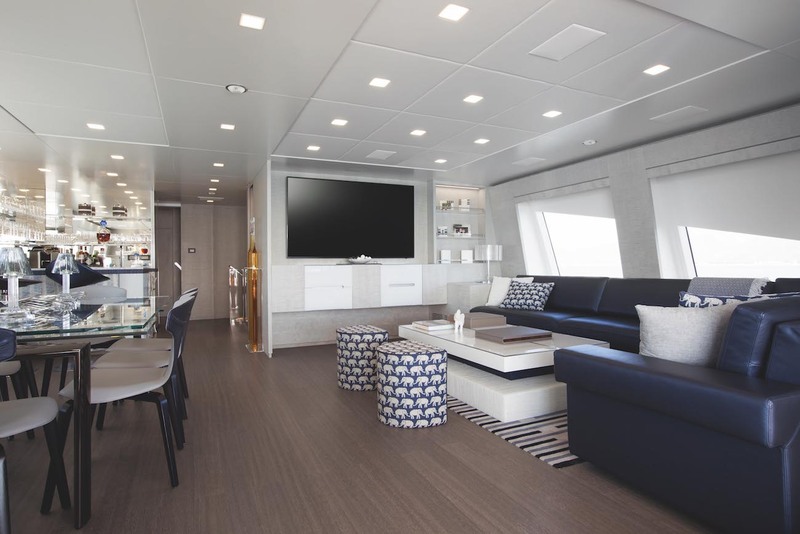 With a wonderful layout, the interior can be described as contemporary and cool. 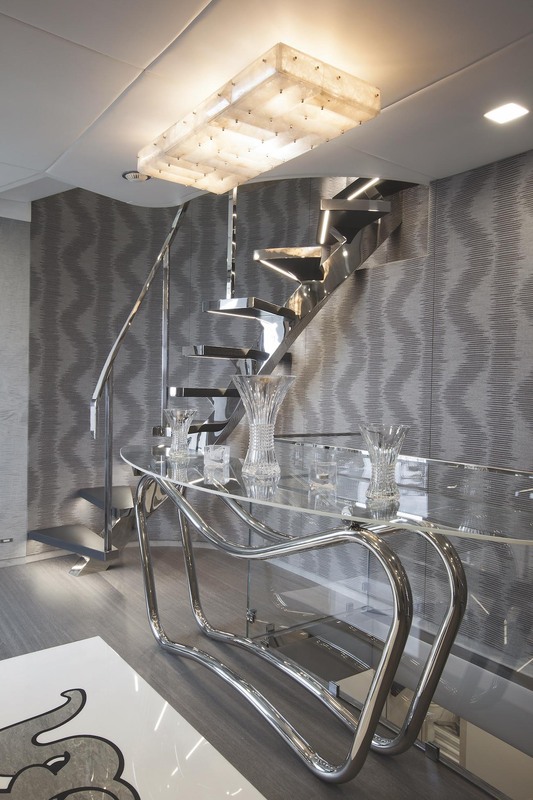 Soft leather contrasts nicely with marble and glass to create areas that are idyllic to sit in an impressive when entertaining. 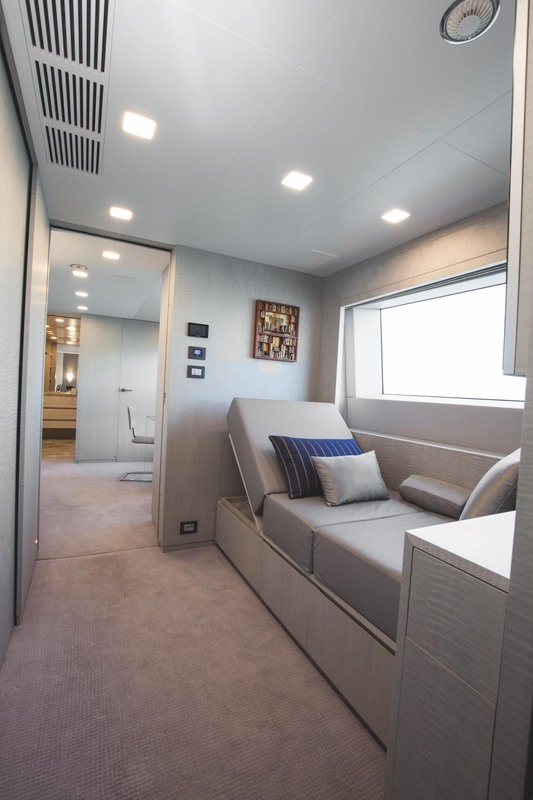 Leather panels in the floor and woven leather detail in the cabins offset beautiful elephant motifs. 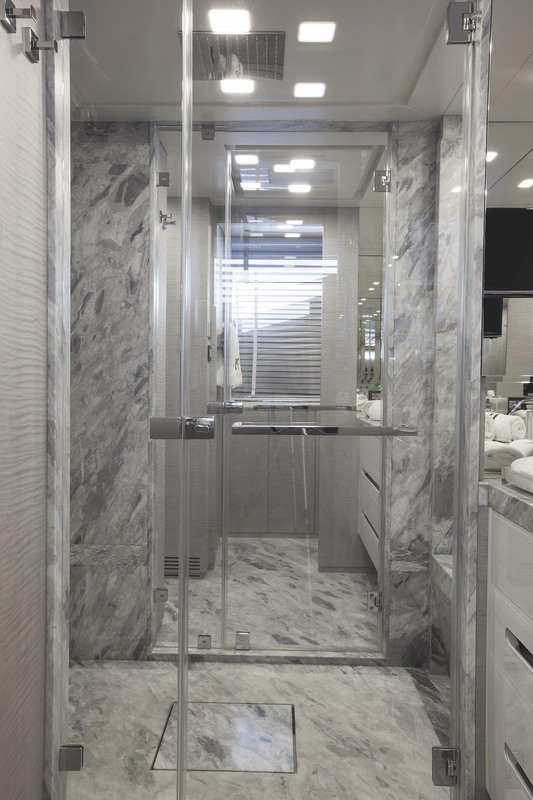 An enormous mirror clock in the foyer and elegant fittings can be found in the day head. 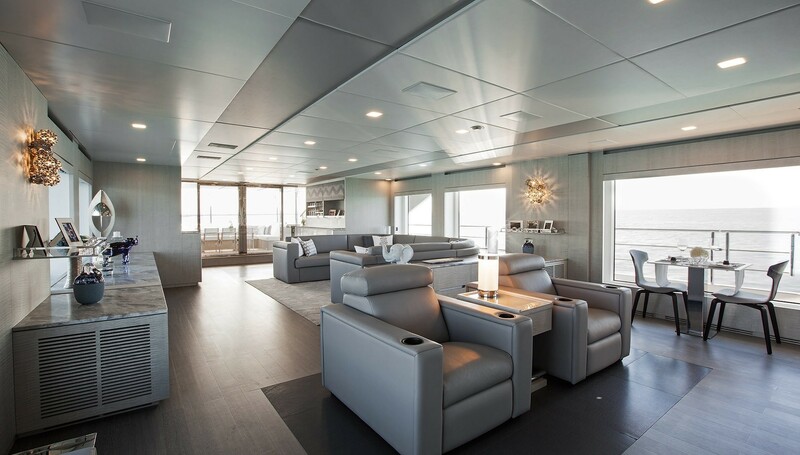 The main saloon has large windows along with a cinema area with two reclining cinema seats in front of a screen. 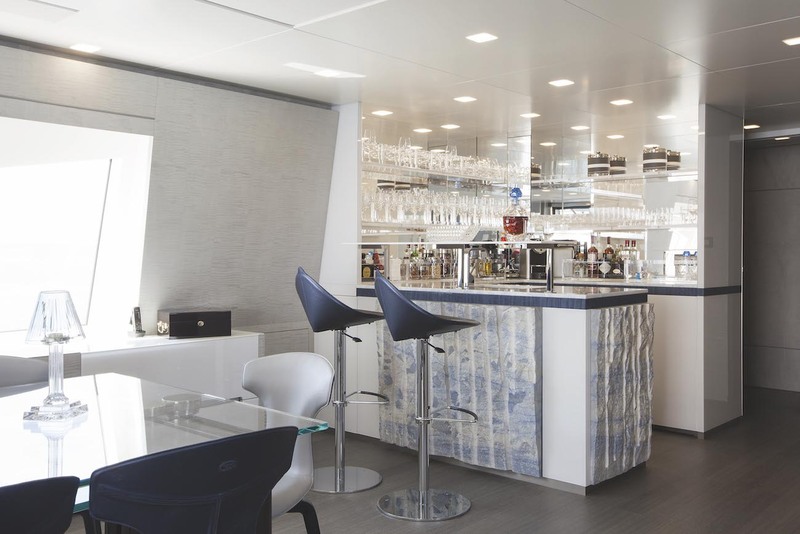 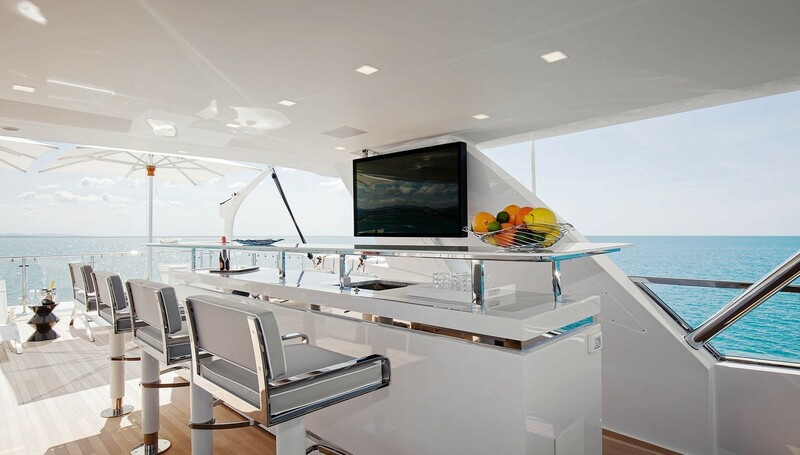 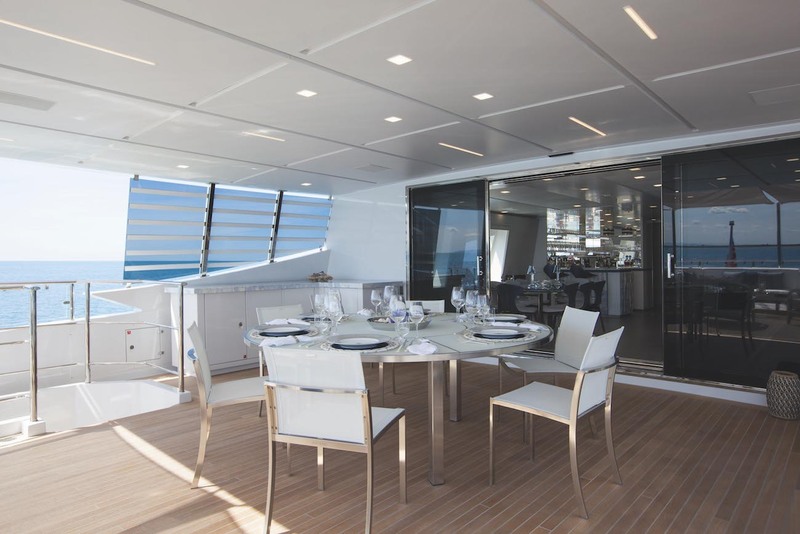 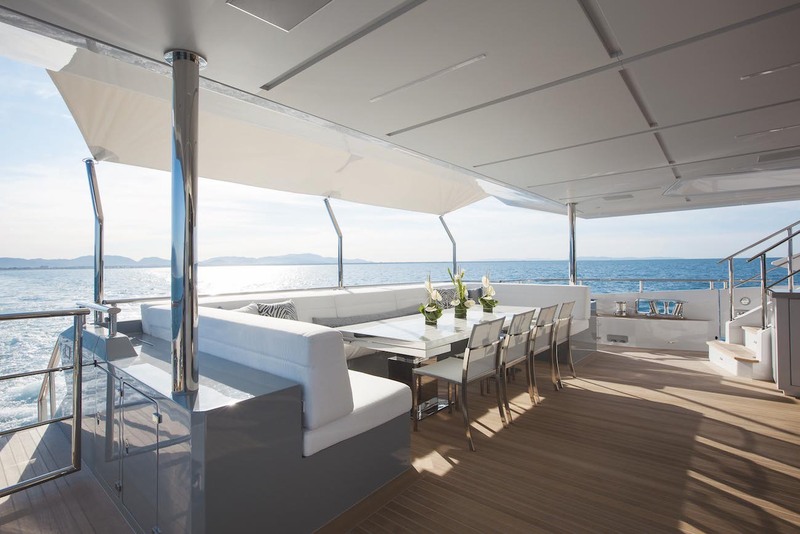 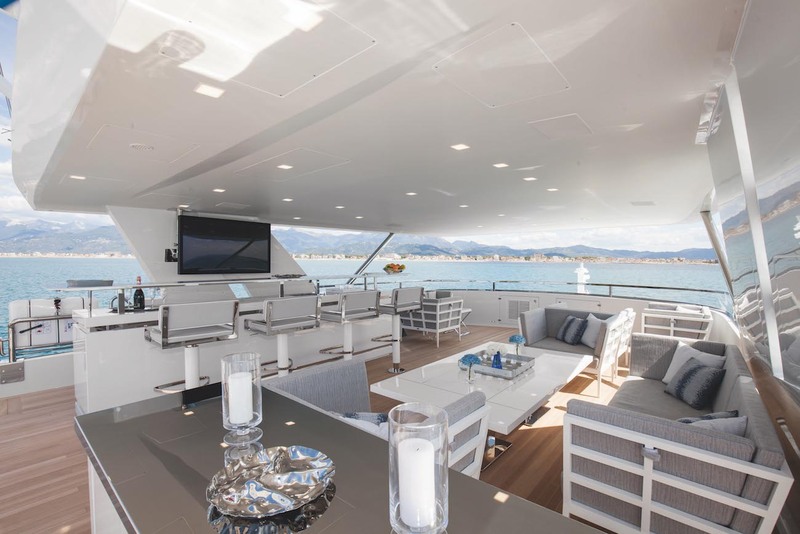 The yacht also features a central bar counter which runs the entire length of the bulkhead. 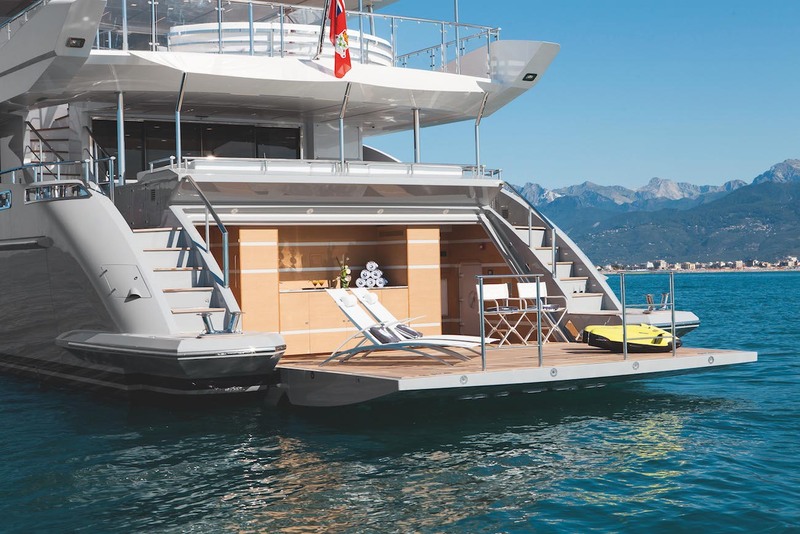 The tender garage is placed transversely to the beam and houses the many water toys as well as the Castoldi jet tender. 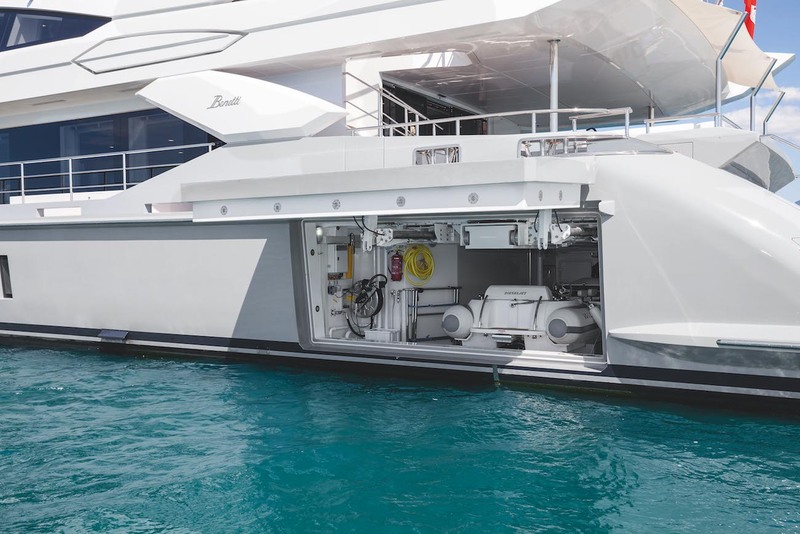 Along with a GRP superstructure and composite hull, she also features at anchor stabilisers which work at zero speed. 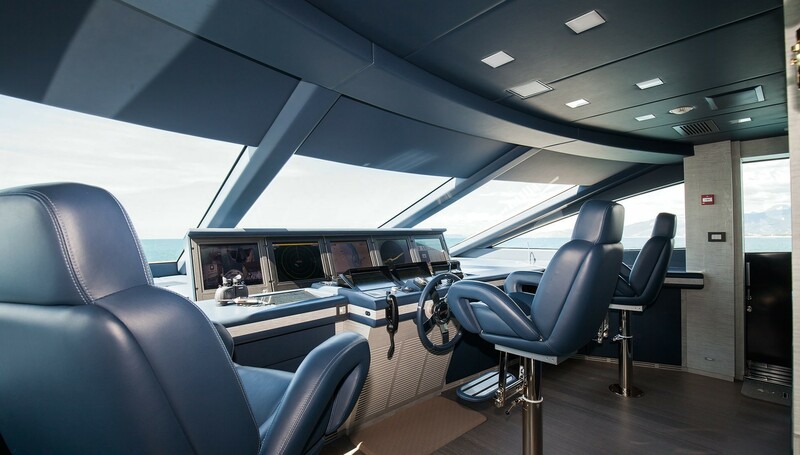 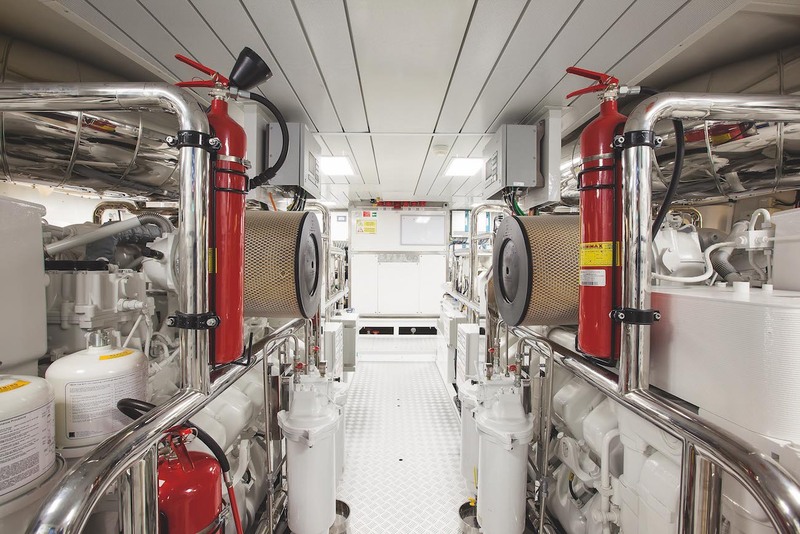 This increases onboard comfort whether at anchor or sailing on rough waters. 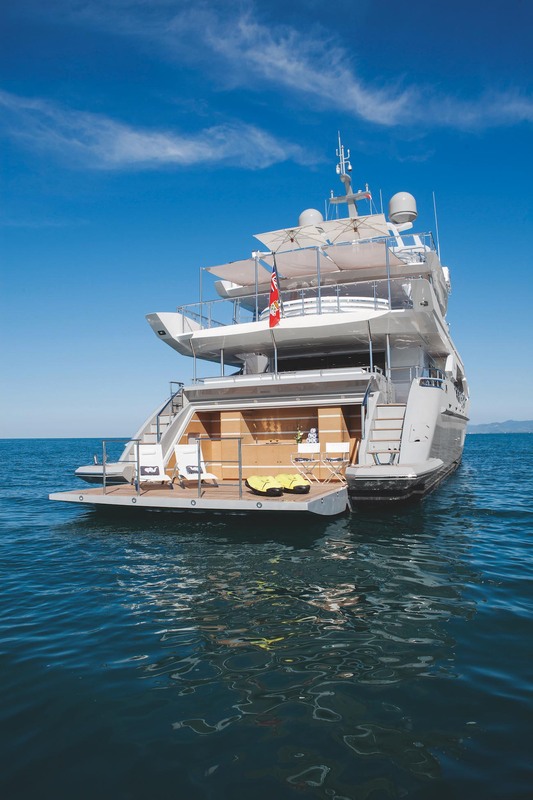 Her range is 1,200 nautical miles from her 35,000 fuel tanks, a combination of sheer luxury and great performance. 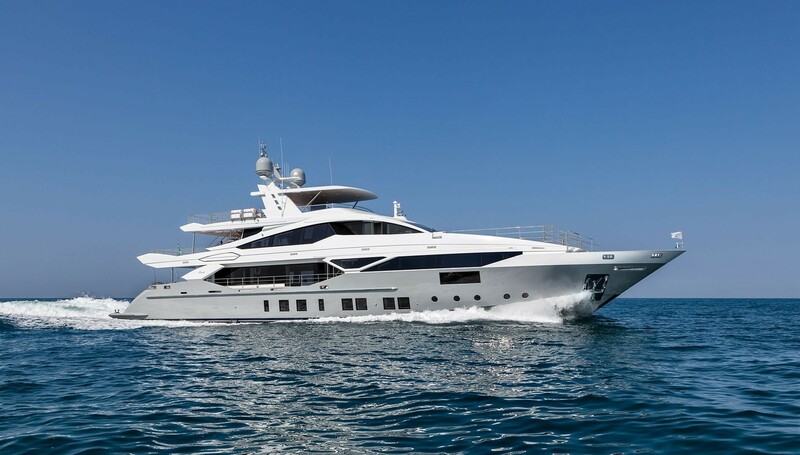 Benetti Veloce 140’ has a top speed of 21 knots and a cruising speed of 19 knots. 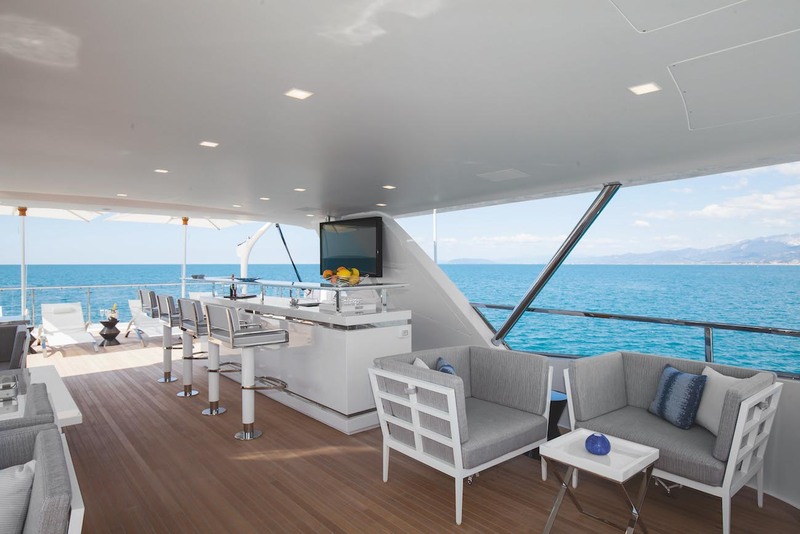 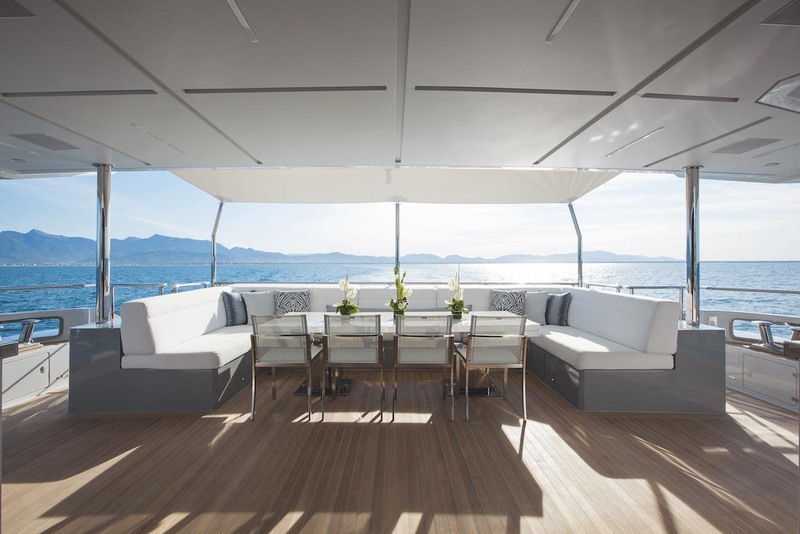 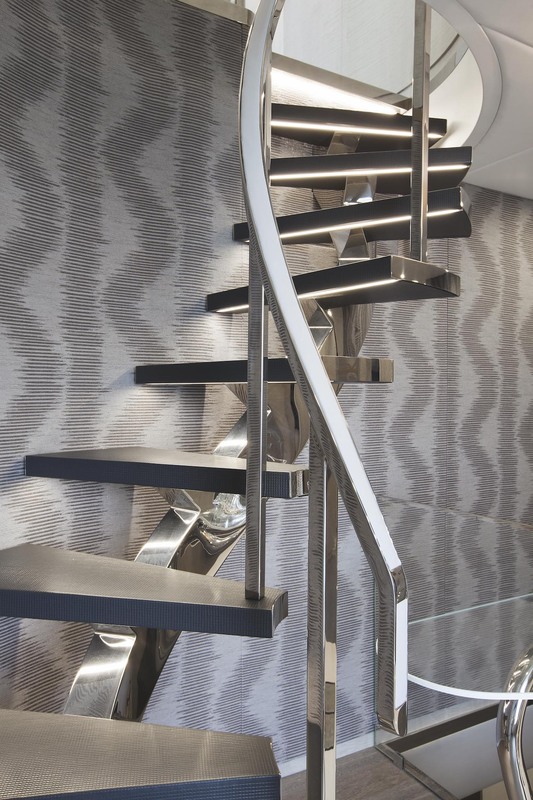 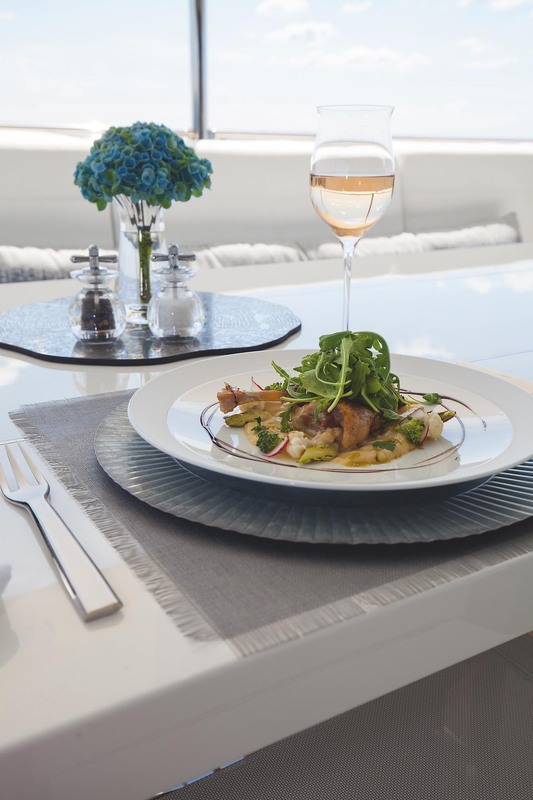 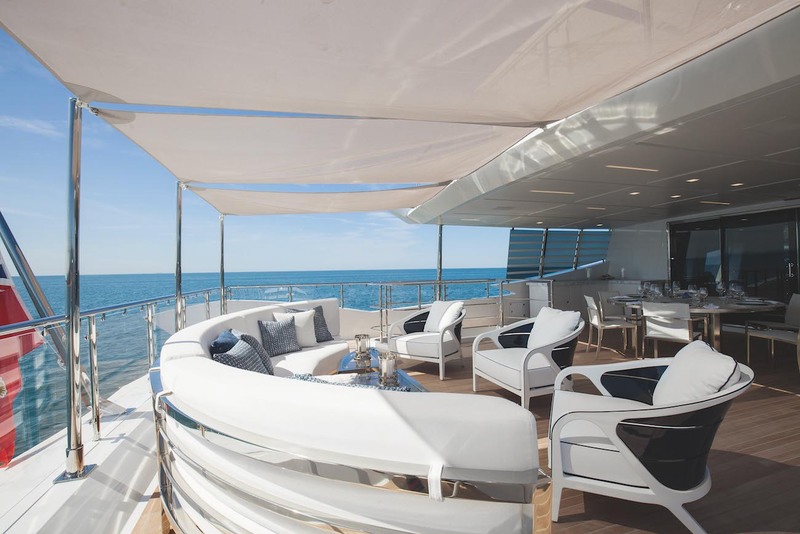 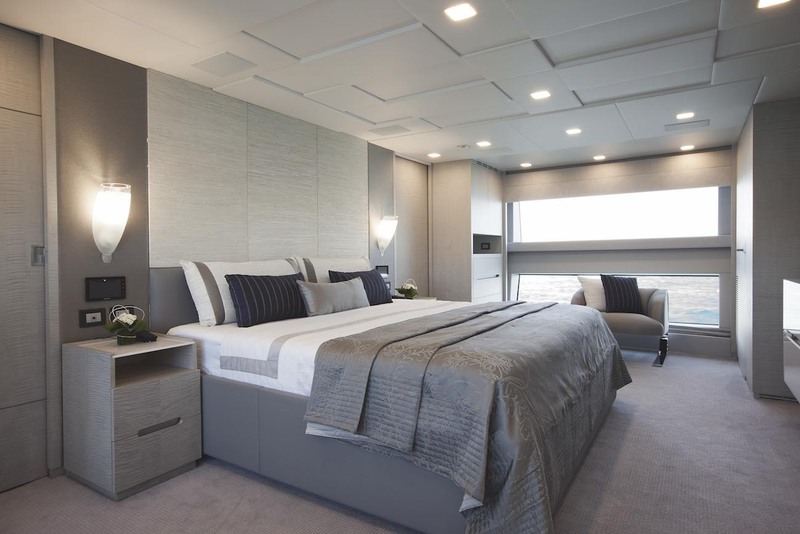 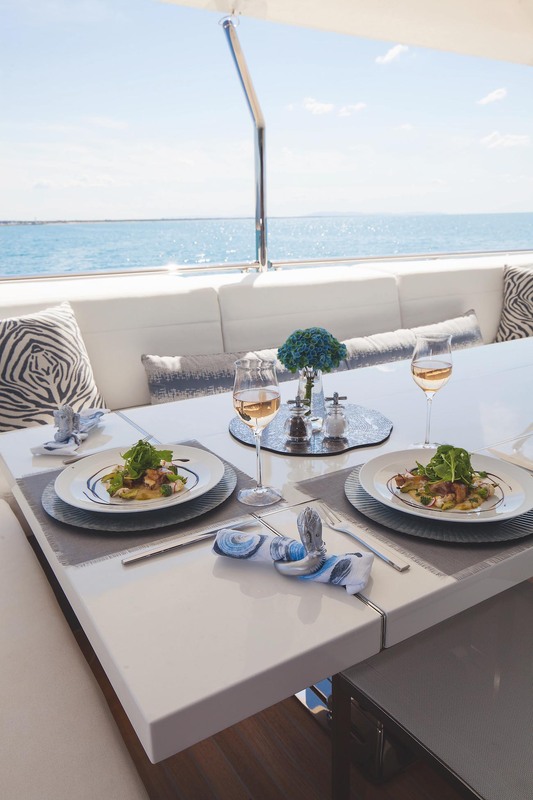 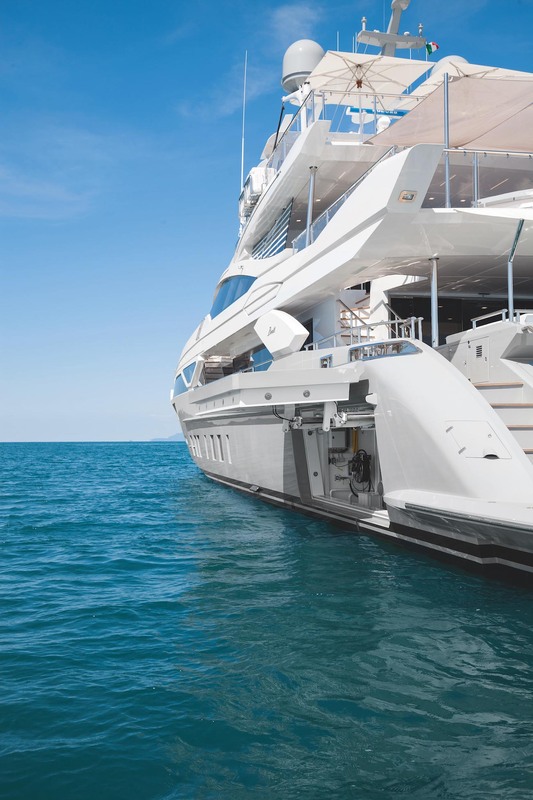 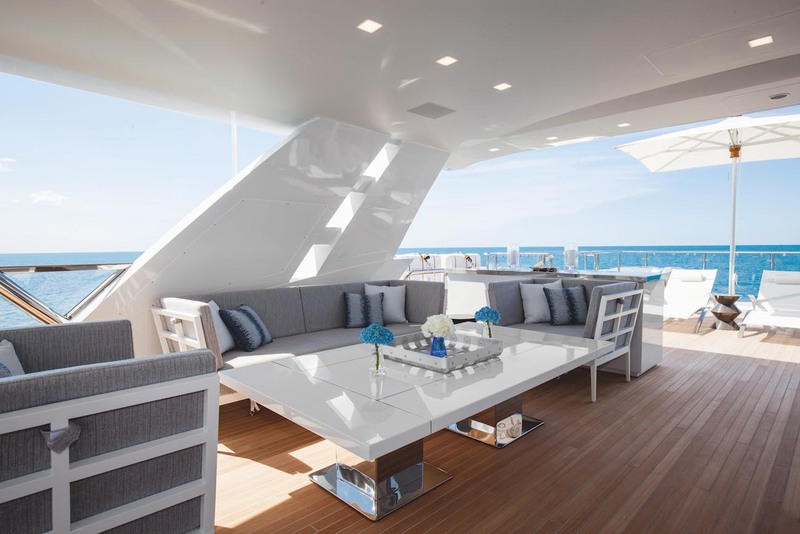 The 43m Benetti Veloce accommodates up to 10 guests in five very attractive rooms. 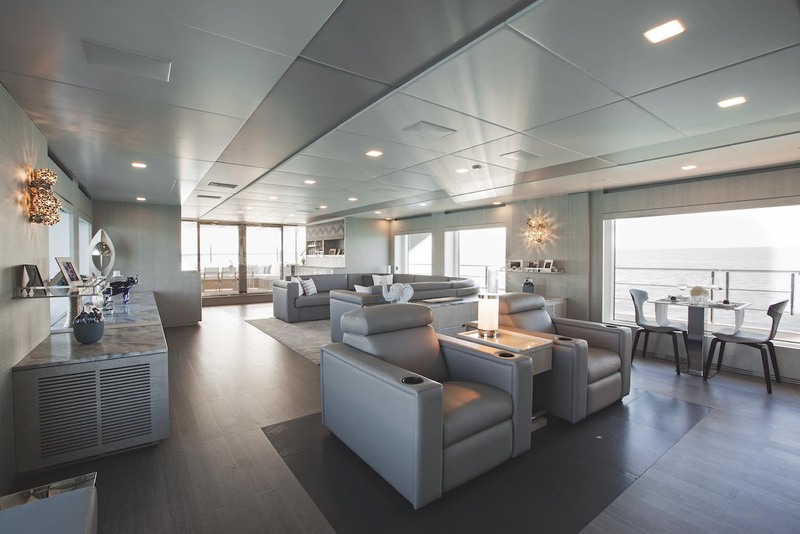 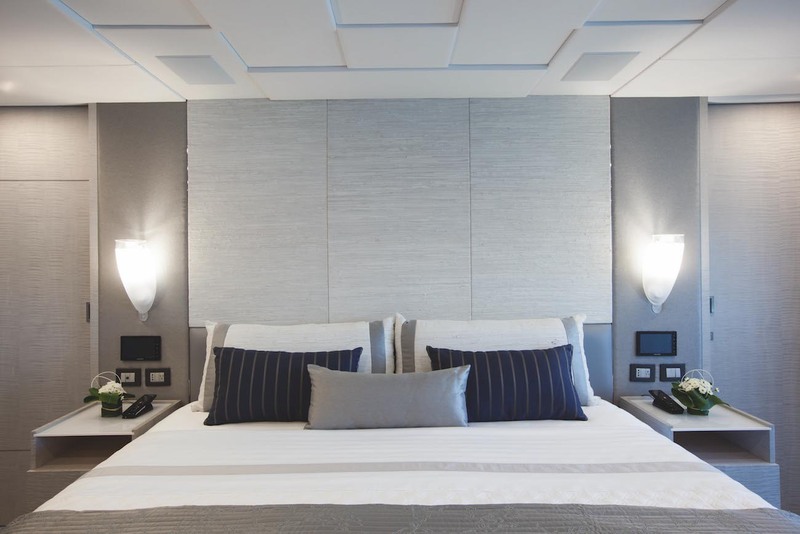 These include 2 VIP staterooms, 2 twin cabins, 3 double/twin cabins and an eye-catching master suite. 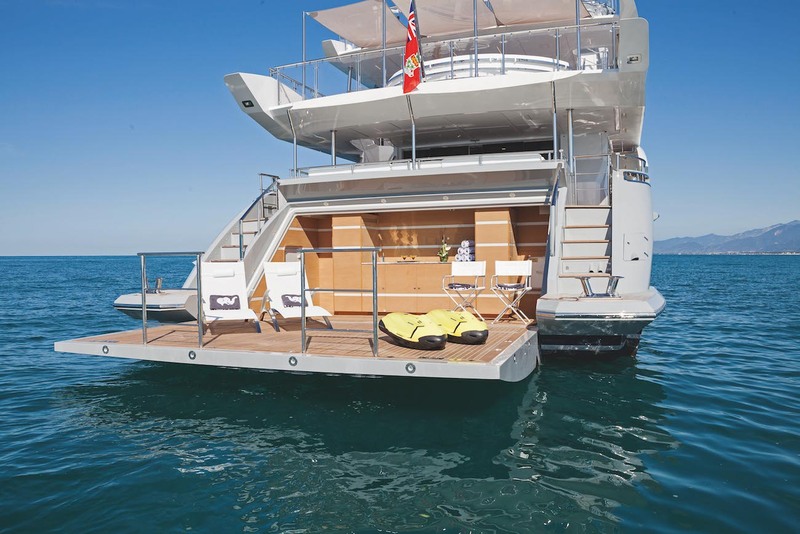 With a crew of 8 she is indeed the ideal vessel for socialising with family or friends. 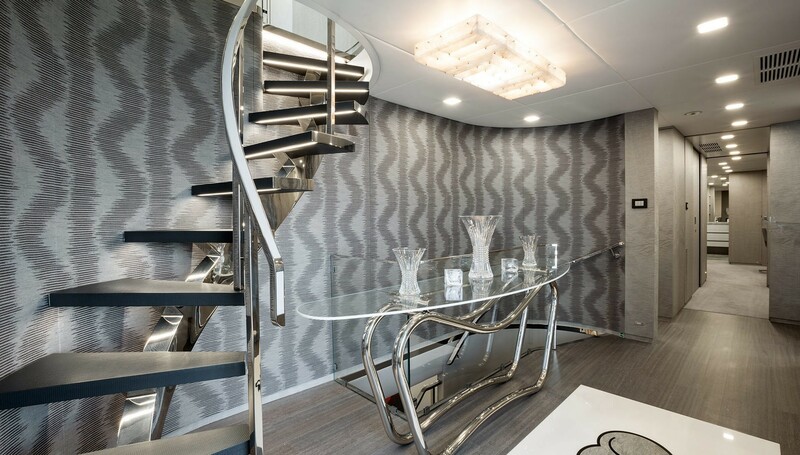 The lovely foyer provides access to the full beam master suite that has his and hers walk-in closets. 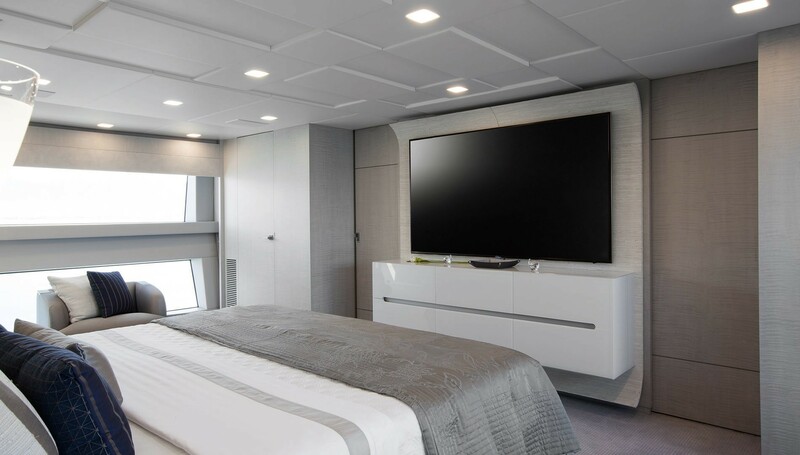 There’s also an ergonomic day bed in front of a TV screen. 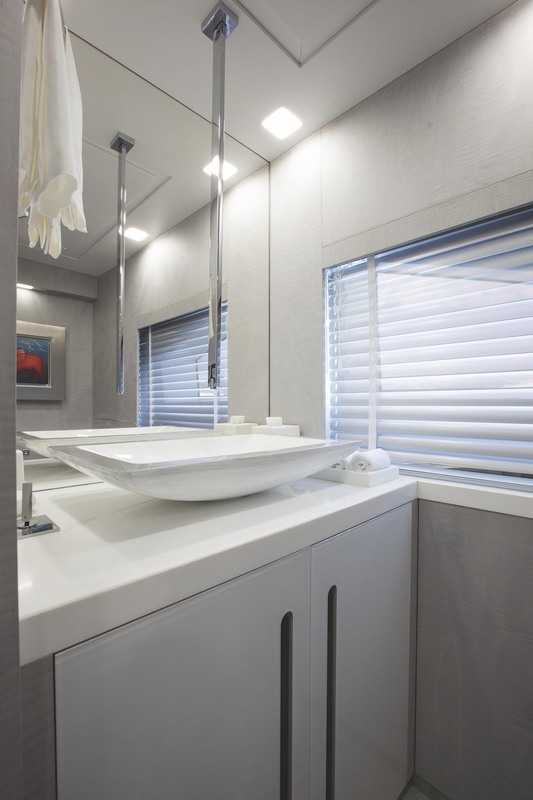 His and hers bathrooms have heated flooring and are connected by a shared shower with heated seat.